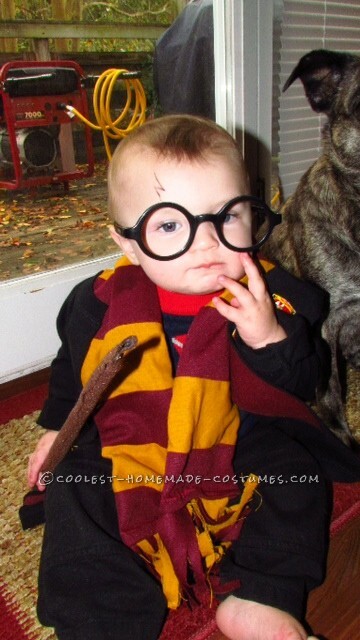 I knew I wanted to make my 8 month old baby boy Harry Potter this year. I didn’t want to buy the costume-I wanted to make it more personal. It started when I found gold and maroon fabric remnants on clearance at the craft store. I cut up some strips and sewed them in an alternating pattern-just like the scarves in The Sorcerer’s Stone. Then I found a black long sleeve shirt that was about 2/3 sizes too big. I cut it up the middle of the front to make a robe. I found a Gryffindor patch on eBay for $3 and ironed it on the front. I also bought a $3 pair of glasses online and punched the lenses out so they didn’t mess with his vision. For his wand, I took a skewer and wrapped it in brown felt (making sure to cover the sharp edges). As a bonus, I found a sweater at Target that had a red striped tie applique on the front. I put this under his robe, paired with some black pants. 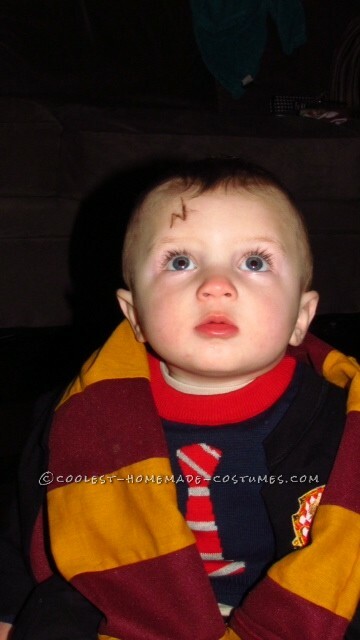 The very last touch was Harry’s signature lightning bolt scar-brown eyeliner. 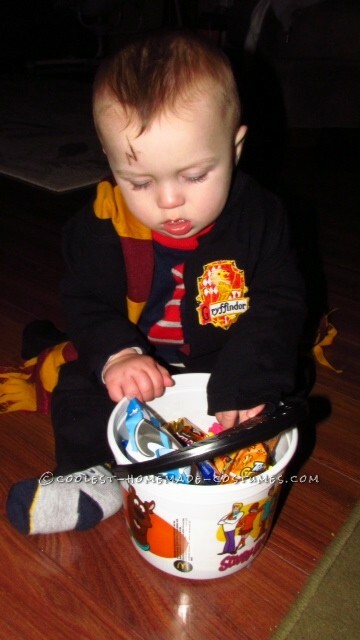 Everyone LOVED little Harry when we went to a party and trick or treating! Some people even wanted pictures with him! How did you get the glasses to stay on?